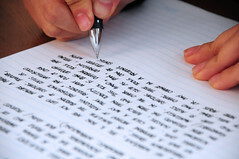 As it’s a leap year this year, my writing challenge will finish with note 366 on 30 April 2012. Today I will start the 100 day countdown. I thought I would use today’s post to reflect on the past 266 days and think about the skills that I have gained or improved on. The ability to focus – I’ve always been able to concentrate on what I am doing, but things used to take me longer to complete. Being a bit of a perfectionist, I would spend ages on the detail and probably post a blog after a week instead of a few hours. In the last 266 days I have improved my ability to focus on the writing task at hand (more so in the last few weeks actually) and feel confident in posting something even though I may have only decided on the title a few hours before. Increased awareness – I’ve increased my awareness of the English language and how it relates to words in other languages. I am also much more aware of anything I read. I notice the way things are spelled and the way the work is presented, which brings me to the next point. Enhanced presentation – By writing something every day, reading grammar and punctuation books, and reading other people’s blogs and articles, I’ve learnt new skills in organising content and laying it out in an easy to read format. Meeting deadlines – Due to the midnight deadline that I set myself every day, I have learnt to do things much quicker, which has actually helped in my day job too. I have learnt to complete things with ease and confidence. Increased efficiency – As I now think of topics in advance as well as having a theme for the week, as in this week with commonly misspelled words, I can write, edit and publish a blog so much quicker than before. Writing concisely – William Zinsser (a great writer and author) has taught me well here via his audio programme called On Writing Well. I try to eliminate unnecessary words and cut out the waffle as much as I can. It also helps reading the work of other writers that I believe carry this out well. Preparing in advance – Although I’m still researching, learning, and writing daily, I have started to prepare for future posts now. If someone asks me the spelling or meaning of something, I hear about an interesting topic or I’m inspired by another writer’s article, I make a quick note to research that subject another day. For the less inspired days, I then have something to hand as a prompt. Better at multi-tasking – I think most women (sorry – and some men) can multi-task, but I have definitely got better at it in the last eight and a half months. I can write or edit blogs whilst doing a number of things such as cooking dinner and walking (by using voice memos on my phone). Although I am on countdown, I won’t stop writing or blogging completely after 30 April 2012; I still have a number of other blogs, but I need to consider what to do with this blog: My Writing Notebook. Do I still add posts every day or just a few times a week? Do I turn this blog into a series of ebooks or do I revamp the site and display it as information? Would you like to see this website continue with more of the same? If you have a few moments please leave me a comment to let me know your thoughts. Thank you.